Synology RackStation RS1619xs+ is a high-performance 1U rackmount NAS with comprehensive storage, data backup, and collaboration applications, suitable for small- to medium-sized businesses. 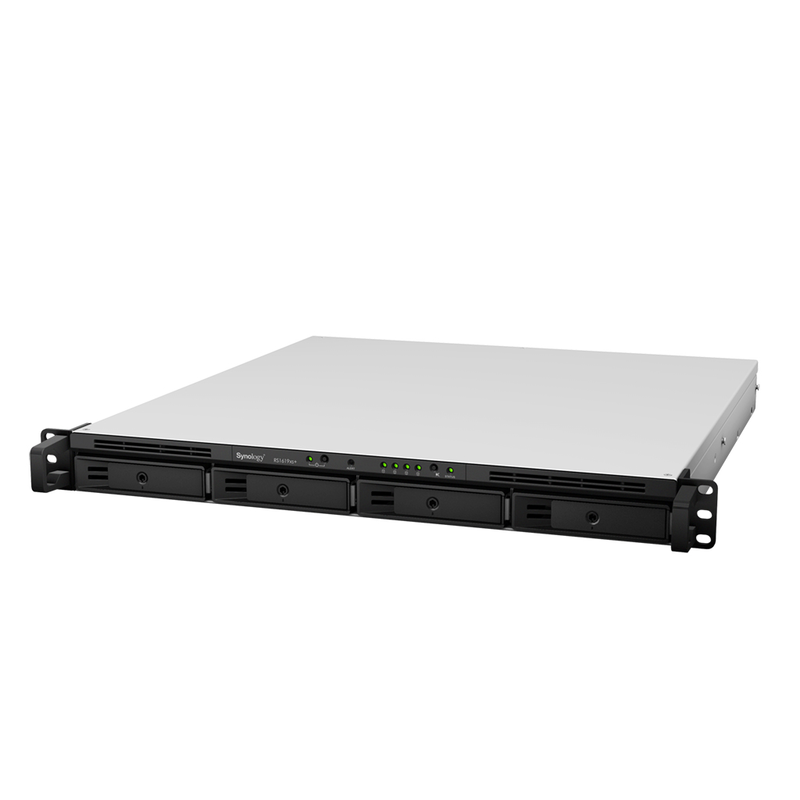 RS1619xs+ simplifies data management, optimizes virtualization environments, and rapidly expands storage capacity with minimal time investment in setup and maintenance. Synology RS1619xs+ is backed by Synology’s 5-year limited warranty. Synology RS1619xs+ is a 1U 4-bay rackmount network attached storage solution equipped with a quad-core processor, 8 GB DDR4 memory (expandable up to 64 GB), and four Gigabit LAN ports. With an optional 10GbE network adapter card installed, RS1619xs+ delivers sequential reading throughput over 1,523 MB/s and 136,558 iSCSI random read IOPS under a RAID 5 configuration. RS1619xs+ comes with two onboard M.2 SSD slots, allowing fast system cache creation with M.2 2280 NVMe/SATA SSDs without occupying internal 3.5 drive bays. RS1619xs+ also provides great flexibility to easily scale up to 16 drives when connected to one Synology RX1217/RX1217RP expansion unit2. Storage capacity can be expanded according to your business needs with minimal effort. Windows AD and LDAP support allows easy integration with existing business directory services. Windows ACL support provides fine-grained access control and efficient privilege settings, allowing RS1619xs+ to fit seamlessly into existing infrastructure. Internet file access is simplified by the encrypted FTP server and the web-based file explorer Synology File Station. HTTPS, firewall, and IP auto-block support ensures file sharing over the Internet is protected with a high level of security. File self-healing: Btrfs file system is able to auto-detect corrupted files with mirrored metadata and recover broken data using the supported RAID volumes, which include RAID1, 5, 6, and 10. A cutting-edge iSCSI service built for IT administrators that offers advanced LUN and provides lightning-fast snapshot creation, recovery, and cloning. RS1619xs+ is designed with virtualization in mind. Virtual Machine Manager enables you to test new software in sandboxes, isolate your customers' machines, and increase the flexibility of your server. Various Operating Systems Support lets you run Windows, Linux, and Virtual DSM on your Synology NAS in just a few steps. Live Migration lets you seamlessly migrate Virtual DSM instances from one Synology NAS to another. Flexible IT Resource Management allows you to allocate hardware resources like computing power, storage space, or network interfaces across several virtual machines. Synology Drive allows you to access the data and files on Synology NAS through a unified portal and allows cross-platform synchronization for you to access data from anywhere. You can also install the online editor Synology Office and collaborate with others on Document, Spreadsheet, and Slides. Synology Calendar enables you to manage team schedules, and organize daily tasks effortlessly. Event information can also be synced to your CalDAV clients, allowing you to check schedules anywhere and anytime. Synology High Availability ensures seamless transitioning between clustered servers in the event of unexpected disasters and ensures that your services remain online. Snapshot Replication provides schedulable, near-instantaneous data protection, ensuring business documents in shared folders, virtual machines in iSCSI LUNs, or dockerized application data remain safe and available in the event of a disaster. Redundant power supplies, system fans, and network ports with failover support ensure continual service uptime. High reliability system design, including fan-less CPU heat-sink and passive cooling technology, prevents single points of failure. DDR4 ECC U-DIMM reduces power consumption and has error detection and correction capabilities during data transmission.